MILWAUKEE, WI--Given the fact that Milwaukee's baseball team is known as the Brewers - a name honoring Miller, Pabst, Schlitz and Blatz, all of which have called the city their home - it should be no surprise that native Milwaukeeans know how to throw a party. However, few events evidence this fact as well as Summerfest, quite literally the world's largest music festival, which this year celebrated its 40th anniversary at Henry Maier Festival Park on the picturesque shores of Lake Michigan. The Violent Femmes perform at 2007's Summerfest. Between June 28 and July 8, almost a million people made their way to the festival grounds to eat and drink at nearly 50 diverse food and beverage vendors, shop at four large marketplaces and, of course, check out a never-ending stream of bands - more than 550 in total performing on a dozen different large-scale concert stages. 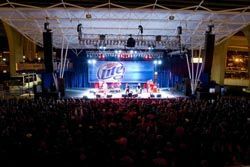 Milwaukee World Festival is the non-profit group responsible for Summerfest, and, as it had done for many years in the past, the organization called upon local production company Clearwing Productions to handle the lion's share of this year's sound reinforcement duties. In turn, Clearwing again chose to largely rely on L-ACOUSTICS loudspeakers - over 200 enclosures in total - to deliver audio to the masses on many of the Big Gig's largest stages. Of particular note this year, Clearwing specified a 24-box KUDO system for the Miller Lite Oasis Stage that uniquely benefited from the world's first use of L-ACOUSTICS' new SB28 subwoofer, which hasn't even officially been introduced to the marketplace yet. According to Clearwing's resident Certified V-DOSC Engineer (CVE) Scott Sugden, "We were fortunate to get our hands on 16 of the very first SB28 subwoofers shipped to the US just in time for this festival and were extremely happy with how they performed. Although I've always considered the SB218 to be a great sub enclosure, the new SB28 offers a significant increase in overall output. It's astounding; I've never heard so much low-end out of so few subs in all my life.. Chicago rap artist Lupe Fiasco performed at the Oasis Stage on the final night of the festival and there was so much low-end coming off the stage that it was overpowering acts on several other stages in the area.